According to the poll we included in the VW Thing post last week, Jalopnik readers give a definite thumbs-up to the inclusion of VW Beetles in the Down on the Street series. Looks like DOTS Beetle Week lost by a whisker... but don't worry, Beetle fans- I'll make sure our little air-cooled friends appear here on a regular basis. Today we're going to look at a solid '64 Type 1 I found parked on the west side of the island. We're going back to the old format for today, in accordance with the poll results from yesterday, but I might experiment with some ways to get some higher-res images here and there. Volkswagen Thing, with Bonus Beetle Poll! Sometimes I get to talk to the owner when I shoot a DOTS car, and this is one such car. The owner was in the garage, wrenching on his '69 Chevelle, when I broke out the camera. I really prefer the '66 and older headlight style. Yeah, the newer type has fewer things to go wrong, but so what? This Beetle isn't show quality, but it's solid and rust-free, it's been lowered just enough to look good, and the engine has been treated to a recent rebuild. The owner tells me he plans to give this car the Volksrod treatment in the near future. It's great to see the old yellow-on-black California plates still on the street. 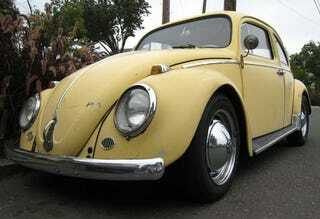 This is the oldest Beetle I see parked on Alameda's streets, though only by a couple years. Stay tuned for more! Though I've talked to a fair number of friendly DOTS car owners while doing this series, this is the first one who would let me put his photo up on the site (that's him on the left). Check out that garage- not only the Chevelle, but a bunch of old British bikes and vintage bicycles to boot! Alameda has tons of these narrow-opening, semi-basement garages, dating from the 1910s and 1920s; they were great for tall, skinny cars but not so good for anything built after about 1930. Still, you can get a Chevelle into one if you're very, very careful.